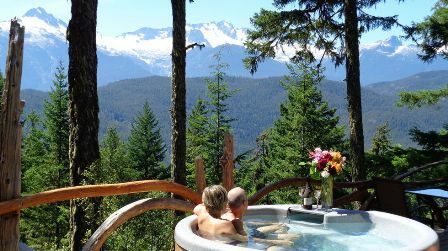 Where eagles soar, majestic mountains touch the BC sky, old-growth forests whisper of beauty untold, it is here perched on the edge of wilderness you'll find a hideaway that will take your breath away and accommodate you like never before. 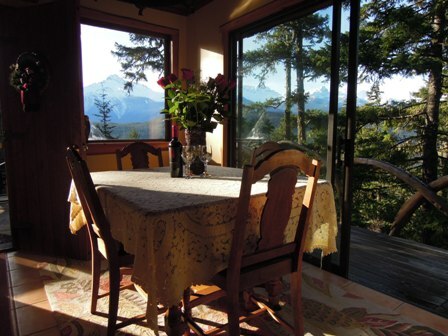 This chalet near Squamish is a secluded, fully-equipped vacation rental with hot tub and spectacular mountain views. 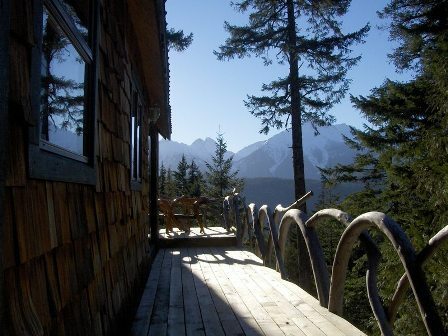 It is truly an unforgettable accommodation for those seeking a quiet retreat in nature. 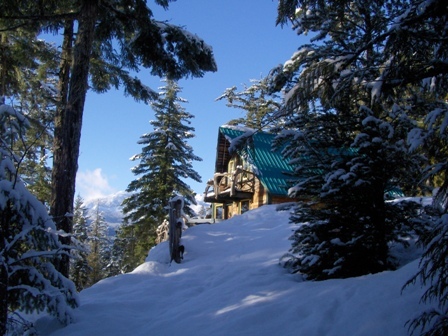 This up-scale, private chalet with natural spring-water hot tub is perched high upon a rock bluff facing a panorama of the Tantalus Mountain Range and Glaciers. 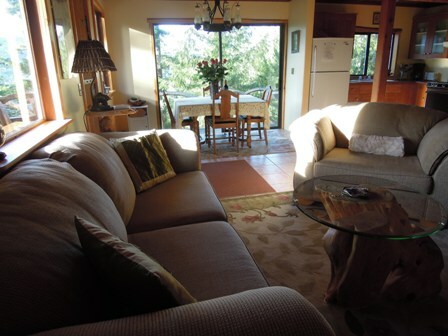 The self-contained and self-catered rental is fully appointed with full-sized fridge, gas stove, pots, and dishes, etc. A barbeque and wood stove are provided for outdoor cooking. There is a large 3 piece bathroom with ample towels. Furnishings are tasteful with hand-crafted accent pieces in keeping with the natural surroundings. 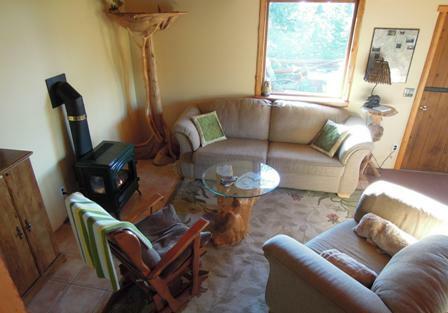 A fireplace, DVD/VCR/TV and cozy couches make for a comfortable living space. This romantic cottage is ideal for couples who are looking for the perfect get-away. 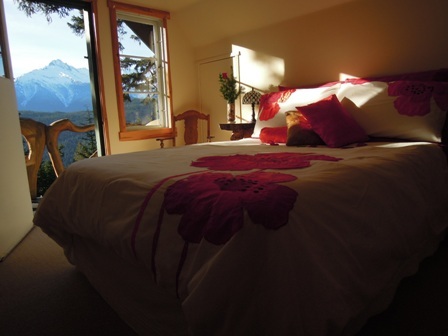 Tantalus View Retreat is a paradise destination especially suited for "undisturbed" romance, whether it is your intimate wedding, honeymoon, anniversary or simply to treat your darling to a special weekend getaway. 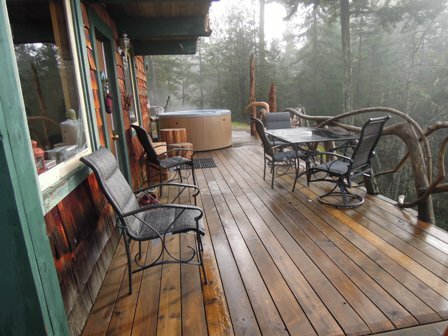 Start your day in the "clothes-optional" natural spring-water hot tub, coffee in hand. If early enough the salmon glow of the sunrise will not only ignite the Tantalus Mountain Range before you but will re-ignite the embers of love between you and your beloved. 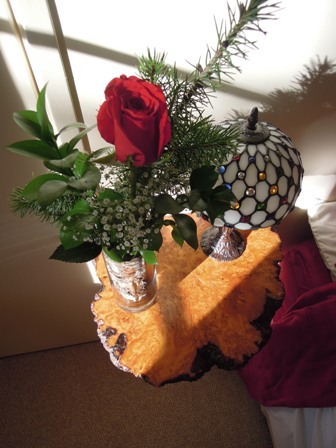 Then step out the door of your "love nest" for a hand-in-hand walk into the old-growth forest. Smell the evergreens surrounding you. 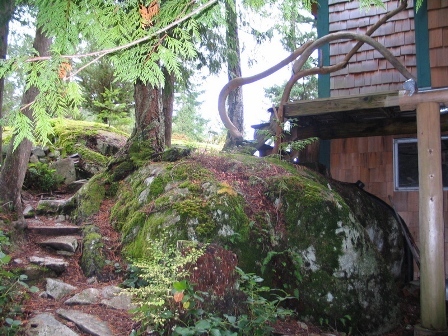 Feel the moss on the bedrock cliff on which your private chalet is perched. Hear the sounds of nature the way creation intended them. Let the rich colors of nature's beauty refocus your vision. You can end your day with a candlelit barbequed steak dinner before you nestle into the comfort of Egyptian cotton luxury. 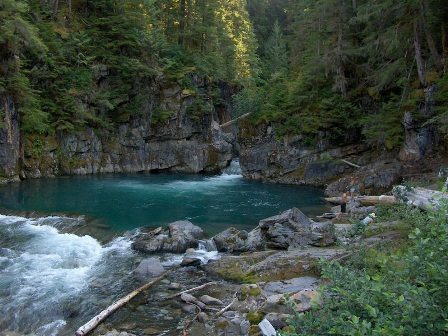 The property is surrounded by old-growth forest sporting many well marked trails over varied topography with picturesque view points. In winter, snowshoeing and back-country skiing make a winter visit very enjoyable for those who like the pristine outdoors. 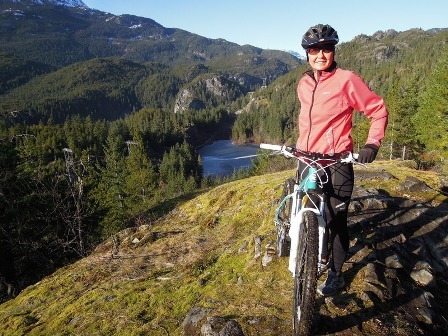 The close proximity to Garibaldi Provincial Park makes this an ideal location for hikers, mountain-bikers and outdoor enthusiasts. All rates subject to 5% G.S.T.